Follow along below with our live thoughts and analysis during tonight’s final, College World Series finals deciding game 3 between Texas and [tag]LSU[/tag]. The series is tied 1-1 and it’s winner take all tonight in the best-of-three series for the NCAA title. Texas will start pitcher [tag]Cole Green[/tag] with the chance to win the Longhorns’ 6th all-time baseball championship tonight at ESPN at 6:00pm. Follow along below with our live thoughts and analysis during tonight’s rain delayed College World Series finals game between Texas and [tag]LSU[/tag]. Texas is down 1-0 in the best-of-three series and will send out starting pitcher [tag]Taylor Jungmann[/tag] to try to even up things on ESPN at 7:40pm. Follow along below with our live thoughts and analysis during tonight’s College World Series finals game between Texas and [tag]LSU[/tag]. Texas starting pitcher [tag]Chance Ruffin[/tag] will take the mound he’ll face LSU’s tough lineup tonight on ESPN at 6pm. The CWS championship round is a best 2-out-of-3 series, with games 2 and 3 (if necessary) taking place on Tuesday and Wednesday. Follow along below with our live thoughts and analysis during tonight’s delayed College World Series game between Texas and [tag]Arizona State[/tag]. Texas will start [tag]Cole Green[/tag] and he’ll face ASU’s supposedly injured Mike Leake tonight on ESPN2 at approximately 7:45pm. If Texas wins, they’ll advance to face [tag]LSU[/tag] for the championship. In a fantastic and improbable performance, the Texas baseball team came back to win tonight from a 6-0 deficit against one of the top pitchers in college baseball. The Horns knocked off [tag]Arizona State[/tag] and their ace Mike Leake by the final score of 10-6. [tag]Cameron Rupp[/tag] had 2 home runs and freshman pitcher [tag]Taylor Jungmann[/tag] was fantastic in relief of starter [tag]Chance Ruffin[/tag]. The bats came alive throughout the lineup to the tune of 15 hits. Texas is now 2-0 in their College World Series bracket and in fantastic shape to make it to the title game. Arizona State will have a rematch with [tag]North Carolina[/tag] on Thursday for the right to to take on the Horns on Friday evening. Whoever they face, they’ll have to win two in a row to get past Texas. See the game’s live blog for more opinions on the game. 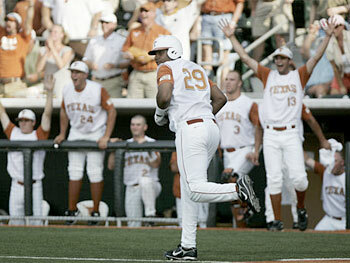 Follow along below with our live thoughts and analysis during tonight’s opening game for the Texas Longhorns at the 2009 College World Series. [tag]Cole Green[/tag] will get the start as the Horns take on [tag]Southern Miss[/tag] at 6pm on ESPN2 and we’ll be posting live on Twitter at twitter.com/40AcresSports. Follow along there to participate in the conversation. Hook ’em! Texas beats TCU, headed back to Omaha! Comments Off on Texas beats TCU, headed back to Omaha! 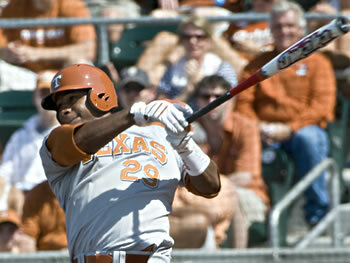 The Texas Longhorns are headed back to Omaha for the 33rd time. The team topped [tag]TCU[/tag] 5-2 to win their Super Regional and advance to the [tag]College World Series[/tag]. The Longhorns won thanks to a complete performance in all facets of the game, getting great starting pitching, great defense, and great fundamental offense and power. Freshman starter [tag]Taylor Jungmann[/tag] allowed only 2 hits over 6 innings to earn the win. The offense was led by [tag]Brandon Belt[/tag] and [tag]Kevin Keyes[/tag] who helped get the Horns off to a quick 3-run lead in the first inning. Keyes homered in the first and nearly had another one later when he double off the top of the rightfield wall. One day after giving Texas fans hope that the offense was hitting its stride at just the right time, the bats fell back to earth as the team fell to [tag]TCU[/tag] 3-2 Sunday afternoon. Starting pitcher [tag]Cole Green[/tag] spread 3 runs over 7.2 innings but the offense couldn’t back him up and fell short in a late comeback. The middle of the TCU lineup featuring Matt Vern and Matt Carpenter once again powered the offense, hitting a home run each to drive in all 3 TCU runs. It’ll be interesting to see if Texas pitches around those two hitters during Monday’s game and forces someone else to beat them. The two teams face off for the right to move on to Omaha Monday at 6pm on ESPN2. Freshman starter [tag]Taylor Jungmann[/tag] will be on the mound for the Longhorns. Texas set an NCAA record Saturday with 7 sacrifice bunts but luckily Texas coach [tag]Augie Garrido[/tag] let third baseman [tag]Michael Torres[/tag] swing away. The senior from California had a career day leading the Longhorns going 4-for-5 with 2 home runs and 4 RBIs (and zero sacrifice bunts) as Texas beat [tag]TCU[/tag] 10-4 in the opening game of the Super Regionals. Starting pitcher [tag]Chance Ruffin[/tag] gave up 3 homers but didn’t make many other mistakes during his complete game win. The Longhorns play TCU today at 2pm on ESPN and if they win they’ll be headed back to the College World Series in Omaha. Times and television have been set for this weekend’s CWS Super Regional for Texas and TCU. Game 1 will take place Saturday, June 6th at 5pm on ESPNU. Sunday’s game 2 will be at 2pm on ESPN. If necessary, the two teams will play in one of two time slots on Monday, either noon or 6pm on either ESPN or ESPN2. Tune in to 40 Acres Sports for all your [tag]College World Series[/tag] coverage. Who will be the next Texas head coach? Great video feature from Longhorn Network on Texas deep snapper (and ex-Green Beret) Nate Boyer. Subscribe to the 40 Acres! Don't miss breaking news or another story from your favorite Longhorns fan site, subscribe to our RSS(?) feed! Bob Big says Puff puff pass.